Objective: Data which indicate a greater role of the central nervous system in the etiology of fibromyalgia are increasing. The goal of the present study is to determine the link between fibromyalgia and attention-deficit hyperactivity disorder (ADHD) and, in addition, to reveal the relevance of impulsivity dimension. Methods: The study included 78 females with fibromyalgia who applied to a physical medicine and rehabilitation polyclinic in Ceyhan State Hospital and 54 healthy females. The diagnosis of fibromyalgia was made by an experienced specialist of physical medicine and rehabilitation based on the American Rheumatology Association Diagnostic Criteria (2010). The diagnosis of ADHD was by an experienced psychiatrist using Diagnostic and Statistical Manual of Mental Disorders-5. The following inventories were used: adult ADHD self-report scale, Wender Utah rating scale, and Barratt impulsivity scale short form. Results: Adult ADHD was detected in 29.5% of the fibromyalgia group and 7.4% of the control group; childhood and adolescent attention hyperactivity disorder ratios in these groups were 33.3% and 11.1%, respectively. The differences were statistically significant (P=0.002, P=0.003). Scores of the fibromyalgia group on the Wender Utah rating scale, adult ADHD self-report scale, attention subscale, hyperactivity–impulsivity subscale, and the Barratt impulsivity scale for non-planning and attentional impulsivity were found to be significantly higher than the control group (P<0.05, P<0.01, P<0.01, P<0.05, P<0.01, P<0.05, respectively). Conclusion: The present study has shown that both adult and childhood ADHD are quite common in female fibromyalgia patients. There was a link between fibromyalgia and impulsivity. Certain subtypes of fibromyalgia and attention-deficit hyperactivity deficit disorder could be sharing the common etiological pathways. The goal of the present study is to determine the link between fibromyalgia and ADHD, as well as to investigate the relevance of impulsivity dimension in this possible relationship. The study was conducted between June 2015 and June 2016 at Ceyhan State Hospital, Adana. Permission was obtained from the ethics committee of Adana Numune Training and Research Hospital. A written informed consent form was obtained from all participants before inclusion in the evaluation. Participants were divided into two groups, a fibromyalgia group and a control group. The study group included 78 females with a diagnosis of fibromyalgia who applied to physical medicine and rehabilitation outpatient clinics in Ceyhan State Hospital. The control group consisted of 54 healthy female volunteers who were recruited with local newspaper ads from the same region. The study group and the healthy volunteers were evaluated by the same psychiatrist (EY) to find out the diagnosis of childhood and adult ADHD. another disorder that would otherwise explain the pain should be excluded. The presence of childhood ADHD is essential for the diagnosis of adult ADHD. In order to reduce failures inherent to remembrance of childhood memories, participants were selected were between 18 and 55 years of age. All participants were female. People whose education levels were sufficient to complete the forms were included in the study. Anyone with a mental illness at a level that could hinder the evaluation, such as mental retardation, schizophrenia, or other psychotic disorders, was excluded from the study. This form was developed by the researchers and included questions on current age, marital status, employment, duration of education (years), and participants’ alcohol consumption and smoking status, and previous suicide attempts, previous (childhood) and current diagnosis of ADHD, or previous and present diagnosis of a comorbid physical illness. Psychiatric and physical illness and previous suicide history were primarily based on self-report of cases and psychiatric examination conducted on site. Information provided by the patients was checked with other accessible sources, such as living parents or siblings, spouses, and available medical files. For statistical purpose, patients with mid and high socioeconomic status were treated as one group while patients who had been divorced or never married were grouped as single and housewives; and students and retired patients were grouped as unemployed. The diagnosis of fibromyalgia was determined by two different experienced physical medicine and rehabilitation experts based on 2010 ACR criteria.1 After confirmation of their diagnosis of fibromyalgia, the individuals were referred to a psychiatrist. Diagnosis of childhood and adult ADHD and the scales (WURS, ASRS, BIS-11-SF, and VAS) were applied by an experienced psychiatrist. For a diagnosis of ADHD, it was required that the DSM-5 criteria were completely met. Eight of the 114 subjects sent to the psychiatrist with a diagnosis of fibromyalgia for this purpose were excluded from the study because their education level was too low for them to complete the scale, seven were excluded because of mental or physical illness, 10 subjects were excluded since they did not accept the conditions of study, and 11 subjects due to insufficient information they provided in scales they completed. Data analysis was performed using the program IBM SPSS-23. The independent samples t-test was used for the comparison of parametric continuous variables (ie, age, psychometric test scores, duration of illness, and education) between fibromyalgia and control groups. The chi-squared test was used to analyze categorical variables (ie, marital status, ADHD rates). In the analyses of categorical variables in 2×2 tables, if 20% of the cells in the cross-tabulation have an expected frequency of 5, or if any cell count is 1, we used Fisher’s exact test to report relevant results. The fibromyalgia group included 78 (59%) participants, and the control group included 54 (41%). The mean age of the fibromyalgia group was 40.3±9.39 years and that of the control group 38.9±8.92 years. No statistically significant difference was found between two groups in terms of age, education level, and marital status (Table 1). ADHD was detected in 29.5% (n=23) of the fibromyalgia group, and 7.4% (n=4) of the control group; childhood and adolescent ADHD ratios were 33.3% (n=26) and 11.1% (n=6), respectively. These differences were statistically significant (P=0.002 and P=0.003) (Table 2). Notes: aFisher’s exact test. x2 = chi-square. Notes: ax2=9.561, P=0.002; bx2=8.58, P=0.003. The scores of the study group on WURS, ASRS, the attention and hyperactivity–impulsivity subscales of the ASRS scale, and the non-planning and attentional impulsivity subscales of BIS-11-SF were found to be significantly higher than those of the control group (P=0.036, P<0.01, P<0.01, P=0.009, P<0.01, and P=0.039, respectively) (Table 3). Abbreviations: WURS, Wender Utah rating scale; ASRS, adult ADHD self-reporting scale. The fibromyalgia group had a significantly higher rate of diagnosis of psychiatric illness than the control group (43.6%, and 20.4%, respectively: x2=7.65, P=0.006). The duration of psychiatric treatment in the past was also significantly higher in the fibromyalgia group (1.49±3.17 years vs 0.32±1.09 years; t=16.54, P=0.001). Comparing the two groups in terms of previous diagnosis of ADHD, it was found that no subject in the control group had been diagnosed with ADHD, while 6.4% of subjects in the fibromyalgia group had been diagnosed with ADHD (Fisher’s exact test, P=0.078) (Table 1). In the fibromyalgia group, a comparison was made of the duration of fibromyalgia and scores on the VAS of the two subgroups of those with and without a diagnosis of ADHD, and no significant difference was found (t=0.75, P=0.38 for VAS, and t=0.78, P=0.37 for duration of fibromyalgia). Previous studies exist searching for childhood ADHD in women with fibromyalgia and on the frequency of fibromyalgia in patients with ADHD.16,27 In the present study, the relationships of fibromyalgia not only with adult ADHD but also with childhood ADHD were investigated using both DSM-5 diagnostic measures and scales. The relationship between fibromyalgia and impulsivity was also investigated. The fibromyalgia group had significantly higher ASRS total, attention, and hyperactivity/impulsivity score than the control group, suggesting higher presence of ADHD features. High frequency of both childhood and adult ADHD among fibromyalgia patients suggests that ADHD could be a predictor of the development of fibromyalgia in the future. Our study has some limitations. Firstly, all the research subjects were female. Secondly, the assessment of childhood ADHD was conducted largely on information obtained from the subjects themselves. This may be affected by lapses of memory. Thirdly, the number of subjects included in the study was relatively small. Fourthly, fibromyalgia diagnosis was drawn from the 2010 ACR criteria.22 The diagnosis of fibromyalgia was renewed by ACR in 2016,43 but we were well into the study at that time. However, the diagnosis of ADHD was given not on the basis of a scale but on the basis of a clinical interview by a psychiatrist. Scale based ADHD assessment included both adulthood and childhood. There are several studies of the relationship between fibromyalgia and personality characteristics, but the relationship between fibromyalgia and impulsivity has not been sufficiently addressed, and so our findings may help guide future studies. The abstract was presented at the 9th International Congress on Psychopharmacology & 5th International Symposium on Child and Adolescent Psychopharmacology in Antalya, Turkey, April 26–30, 2017. The authors have no conflicts of interest and the work was not supported or funded by any drug company. Wolfe F, Clauw DJ, Fitzcharles M-A, et al. The American College of Rheumatology preliminary diagnostic criteria for fibromyalgia and measurement of symptom severity. Arthritis Care Res. 2010;62(5):600–610. Wolfe F, Ross K, Anderson J, Russell IJ, Hebert L. The prevalence and characteristics of fibromyalgia in the general population. Arthritis Rheum. 1995;38(1):19–28. Yunus MB. Gender differences in fibromyalgia and other related syndromes. J Gend Specif Med. 2002;5(2):42–47. Nampiaparampil DE, Shmerling RH. A review of fibromyalgia. Am J Manag Care. 2004;10(11 Pt 1):794–800. Schweinhardt P, Sauro KM, Bushnell MC. Fibromyalgia: a disorder of the brain? Neuroscientist. 2008;14(5):415–421. Yunus MB, Aldag JC. Restless legs syndrome and leg cramps in fibromyalgia syndrome: a controlled study. BMJ. 1996;312(7042):1339. Holman AJ, Myers RR. A randomized, double-blind, placebo-controlled trial of pramipexole, a dopamine agonist, in patients with fibromyalgia receiving concomitant medications. Arthritis Rheum. 2005;52(8):2495–2505. Kravitz HM, Katz RS. Fibrofog and fibromyalgia: a narrative review and implications for clinical practice. Rheumatol Int. 2015;35(7):1115–1125. Gelonch O, Garolera M, Valls J, Rosselló L, Pifarré J. 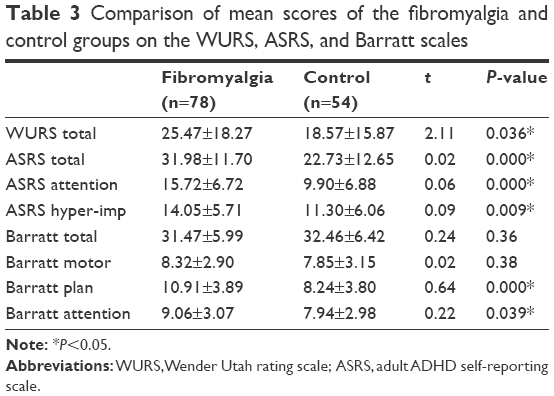 Executive function in fibromyalgia: comparing subjective and objective measures. Compr Psychiatry. 2016;66:113–122. Mostert JC, Onnink AMH, Klein M, et al. Cognitive heterogeneity in adult attention deficit/hyperactivity disorder: a systematic analysis of neuropsychological measurements. Eur Neuropsychopharmacol. 2015;25(11):2062–2074. Thapar A, Cooper M. Attention deficit hyperactivity disorder. The Lancet. 2016;387(10024):1240–1250. Russell VA. Overview of animal models of attention deficit hyperactivity disorder (ADHD). Curr Protoc Neurosci. 2011;54(1):9.35.1–9.35.9. Arnsten AF, Pliszka SR. Catecholamine influences on prefrontal cortical function: relevance to treatment of attention deficit/hyperactivity disorder and related disorders. Pharmacol Biochem Behav. 2011;99(2):211–216. Golimstok A, Fernandez MC, Garcia Basalo MM, et al. Adult attention-deficit and hyperactivity disorder and fibromyalgia: a case-control study. Neuro Open J. 2015;2:61–66. Vorobeychik Y, Acquadro MA. Use of atomoxetine in a patient with fibromyalgia syndrome and attention-deficit hyperactivity disorder. J Musculoskelet Pain. 2008;16(3):189–192. Montoro CI, Reyes del Paso GA. Personality and fibromyalgia: relationships with clinical, emotional, and functional variables. Pers Individ Dif. 2015;85:236–244. American Psychiatric Association. Diagnostic and Statistical Manual of Mental Disorders. DSM-5. 5th ed. Washington DC: American Psychiatric Publishing; 2013. Adler LA, Spencer T, Faraone SV, et al. Validity of pilot Adult ADHD Self-Report Scale (ASRS) to Rate Adult ADHD symptoms. Ann Clin Psychiatry. 2006;18(3):145–148. Dogan S, Oncü B, Saracoglu GV, Kücükgöncü S. Validity and reliability of the Turkish version of the Adult ADHD Self-Report Scale (ASRS-v1.1). Anatolian J Psychiatry. 2009;10:77–87. Ward MF, Wender PH, Reimherr FW. The Wender Utah Rating Scale: an aid in the retrospective diagnosis of childhood attention deficit hyperactivity disorder. Am J Psychiatry. 1993;150(6):885–890. Oncü B, Olmez S, Sentürk V. Validity and reliability of the Turkish version of the Wender Utah Rating Scale for attention-deficit/hyperactivity disorder in adults. Turk Psikiyatri Derg. 2005;16(4):252–259. Patton JH, Stanford MS, Barratt ES. Factor structure of the Barratt impulsiveness scale. J Clin Psychol. 1995;51(6):768–774. Tamam L, Gulec H, Karatas G. Short Form of Barratt Impulsiveness Scale (BIS-11-SF) Turkish Adaptation Study. Neuropsychiatry Ars. 2013;50:130–134. Revill SI, Robinson JO, Rosen M, Hogg MI. The reliability of a linear analogue for evaluating pain. Anaesthesia. 1976;31(9):1191–1198. Reyero F, Ponce G, Rodriguez-Jimenez R, et al. High frequency of childhood ADHD history in women with fibromyalgia. Eur Psychiatry. 2011;26(8):482–483. Derksen MT, Vreeling MJ, Tchetverikov I. High frequency of adult attention deficit hyperactivity disorder among fibromyalgia patients in the Netherlands: should a systematic collaboration between rheumatologists and psychiatrists be sought? Clin Exp Rheumatol. 2015;33(Suppl 88):141. Simon V, Czobor P, Bálint S, Mészáros A, Bitter I. Prevalence and correlates of adult attention-deficit hyperactivity disorder: meta-analysis. Br J Psychiatry. 2009;194(3):204–211. Kessler RC, Adler L, Barkley R, et al. The prevalence and correlates of adult ADHD in the United States: results from the National Comorbidity Survey Replication. Am J Psychiatry. 2006;163(4):716–723. Faraone SV, Biederman J, Mick E. The age-dependent decline of attention deficit hyperactivity disorder: a meta-analysis of follow-up studies. Psychol Med. 2006;36(2):159–165. Kooij SJ, Bejerot S, Blackwell A, et al. European consensus statement on diagnosis and treatment of adult ADHD: The European Network Adult ADHD. BMC Psychiatry. 2010;10:67. Krause K-H, Krause J, Magyarosy I, Ernst E, Pongratz D. Fibromyalgia syndrome and attention deficit hyperactivity disorder: is there a comorbidity and are there consequences for the therapy of fibromyalgia syndrome? J Musculoskelet Pain. 1998;6(4):111–116. O’Boyle M, Barratt ES. Impulsivity and DSM-III-R personality disorders. Pers Individ Dif. 1993;14(4):609–611. Bucourt E, Martaillé V, Mulleman D, et al. Comparison of the Big Five personality traits in fibromyalgia and other rheumatic diseases. Joint Bone Spine. 2017;84(2):203–207. Young JL, Redmond JC, Fibromyalgia RJC. Fibromylagia, chronic fatigue, and adult attention deficit hyperactivity disorder in the adult: a case study. Psychopharmacol Bull. 2007;40(1):118–126. Thieme K, Turk DC, Flor H. Comorbid depression and anxiety in fibromyalgia syndrome: Relationship to somatic and psychosocial variables. Psychosom Med. 2004;66(6):837–844. Clauw DJ, Crofford LJ. Chronic widespread pain and fibromyalgia: what we know, and what we need to know. Best Pract Res Clin Rheum. 2003;17(4):685–701. McBeth J, Silman AJ, Gupta A, Chiu YH, Ray D, Morriss R, et al. Moderation of psychosocial risk factors through dysfunction of the hypothalamic-pituitary-adrenal stress axis in the onset of chronic widespread musculoskeletal pain: findings of a population-based prospective cohort study. Arthritis Rheum. 2007:56:360–371. van Rensburg R, Meyer HP, Hitchcock SA, Schuler CE. Screening for Adult ADHD in Patients with Fibromyalgia Syndrome. Pain Med. Epub 2017 Nov 1. Wolfe F, Clauw DJ, Fitzcharles MA, et al. 2016 revisions to the 2010/2011 fibromyalgia diagnostic criteria. Semin Arthritis Rheum. 2016;46(3):319–329.